There are so many editing services and options for services. Are you stumped? Confused about which service would be the most beneficial? 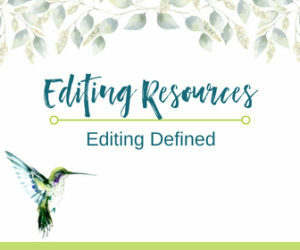 Take a look through the different kinds of editing options to choose the right one for you and where you are in your writing journey. I’m looking for a “big picture” overview. I need to know what is and isn’t working in my story. Characters—Are they realistic and compelling? Dialogue—Is there enough subtext? Does it sound conversational without being loaded with filler? Plot—Is the story arc structured in an efficient, emotionally engaging way? Are there any holes in the story? Setting—Is the location optimal? Are the details woven throughout the story? Hook—Does your opening entice the reader to turn the page? Is it powerful enough? Learn more about how I can help you polish your manuscript. I need help to stay on track, but my writing group isn’t cutting it. As a creative writing instructor, I’ve worked with hundreds of students from beginner to advanced to help them take their writing skills to the next level. Think of this as your own private mini-MFA course. If you need structure with accountability, I’m here to be your personal Writing Coach! My materials are geared toward helping you harness the power of your observations and curiosity. This is what makes your writing unique. It is your greatest asset as a storyteller, and I can help you explore these connections while giving you concrete tools to expand your writing toolbox. We’ll work together through email and Skype every other week for eight weeks in an encouraging, judgement-free zone. I’ll provide lessons, exercises, and short master works tailored to your needs. You’ll also receive honest feedback with suggestions for your next steps. Best of all, you can begin when you want! No waiting for a specific class. I can help you reach your writing goals. I’m not sure if my manuscript is on the right track. I have a specific question and need a second opinion. Then you’ll want to take advantage of my Writing Clarity Session. Whether you’re writing your first story or your tenth, sometimes you need someone with experience to bounce some ideas and get on the right path. We’ll brainstorm together! an honest assessment of your story and characters, offering suggestions for moving forward. strategies and exercises to break you out of the rut and get back on track. advice for developing your strengths and building on them. Tell me a bit about your story and let’s develop a path forward! My manuscript needs to be checked for spelling and grammar (and punctuation while you’re at it). Accuracy—If your story is set in 1860, your characters should not be talking on the telephone. Consistency—Your character’s name is spelled Ally on page 3 and Allie on page 28. I’ll flag that for you. Clarity—I’ll make sure that each sentence is constructed in a way that is grammatically correct, while preserving your voice and style. I will make sure every word in your manuscript is in accordance with the Chicago Manual of Style (16th Ed.) and Merriam-Webster’s (11th Ed.). Copyediting and proofreading are reserved for manuscripts that have been through a developmental edit. I take new manuscripts on a limited basis. Contact me for more information. Take me back to the free resources.